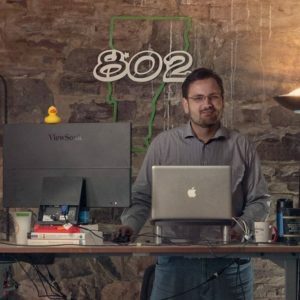 I’m a software developer from Burlington, VT, specializing in WordPress themes, plugins, and libraries. I’ve worked for Google, built a startup from scratch, and now lead a team of developers at Burlington Bytes, who have built over 300 WordPress websites. I love cooking, photography, electronics, and robotics. In my spare time I work with Laboratory B, teaching kids about STEM and building cool stuff. I’ve always got at least a few side projects going, a few of which are listed below. A WordPress plugin that is the most minimal page builder possible. It gives users access to common Bootstrap features like columns, buttons and video embedding, from a simple, visual interface. Sheet music CMS, supporting PDFs, Images, Chord Pro files, and more. Designed to run on a local webserver, to simplify managing music for entire groups. A jQuery plugin to automatically generate slabbed typography. jSabify supports manually setting the breakpoints, or automatically generating them.